The principal act concerning legal metrology in Australia is the National Measurement Act 1960 (Cth) (the Act). The Act and its subordinate regulations, the National Measurement Regulations 1999 (Cth) and the National Trade Measurement Regulations 2009 (Cth) together with guidelines issued by the Chief Metrologist (the National Measurement Guidelines 1999 (Cth)) specify Australia's legal units of measurement of physical quantities, and require that measurements made for any legal purpose are traceable to Australia's primary standards. The Act also provides for the pattern approval and verification of trade and legal measurement instruments. On 1st July 2004, the National Measurement Institute, Australia, (NMIA) was established from the amalgamation of the National Standards Commission (NSC, previously Australia’s national authority for legal metrology), the National Measurement Laboratory, CSIRO (NML-CSIRO, previously responsible for Australia’s physical standards of measurement) and the Australian Government Analytical Laboratories (AGAL, previously responsible for chemical and biological metrology in Australia). From 1st July 2010 the trade measurement inspection and enforcement functions of the States and Territory Governments were transferred to the Commonwealth Government, to be administered by NMIA. NMIA has responsibility for advising the Commonwealth Government on the scientific, technical and legislative requirements of the Australian national measurement system and has specific responsibilities for coordinating the national measurement system, legal metrology, trade measurement and metrication. NMIA provides Australian representation on OIML committees and coordinates Australia's input to the development of OIML international recommendations. NMIA is responsible for administration of the national trade measurement system; including the pattern approval of measuring instruments used for trade and other legal purposes, the licensing of verifiers, requirements concerning the use of measurement in trade more broadly as well as education, inspection, compliance and enforcement activities across the system as a whole. NMIA publishes Australian pattern approval standards and guidelines for manufacturers and importers of measuring instruments that are required to be pattern approved. These documents are harmonised with OIML international recommendations. NMIA also publishes a range of documentation concerning the operation of the national trade measurement system, including verification test procedures that are used by licenced and appointed verifiers and NMI Trade Measurement Inspectors. NMIA is the custodian of Australia's national primary standards of measurement. Information regarding the primary standards maintained by NMIA can be found on our website. NMIA provides Australian representation on The General Conference on Weights and Measures (CGPM), the International Committee for Weights and Measures (CIPM) and their Consultative Committees. It is Australia’s signatory to the CIPM Mutual Recognition Arrangement (MRA) in measurement standards. The Australian primary standards are held and maintained by NMIA (see clause 3.2). NMIA appoints a number of external Australian laboratories as Legal Metrology Authorities that are responsible for the calibration and verification of legally traceable reference standards of measurement, certified measuring instruments, certified reference materials and artefacts. NMIA employs inspectors throughout Australia to monitor, educate and consult with businesses regarding their trade measurement obligations. The inspectorate also conducts compliance and enforcement activities by investigating complaints and taking appropriate enforcement actions wherever necessary. NMIA is responsible for the licensing of servicing licensees and public weighbridge licensees. Servicing licensees test and verify measuring instruments used for trade. Servicing licensees employ verifiers who are nominated to verify trade measuring instruments under the servicing licence. Each servicing licence identifies the class of instrument that the licensee and their verifiers will be verifying. Public weighbridge licensees operate weighbridges so that parties other than the weighbridge operator can weigh goods for the purposes of a transaction. NMIA provides calibration services for a range of physical standards of measurement; more information can be found on our website. NMIA maintains a testing laboratory for pattern approval testing of measuring instruments used for legal purposes including trade. The National Association of Testing Authorities, Australia (NATA) accredits laboratories in industry, educational institutions, semi-government organisations and other administrative bodies, as well as undertakes calibration and testing procedures for which officially recognised certificates are issued. NATA represents Australia in the International Laboratory Accreditation Cooperation (ILAC) and has mutual recognition agreements with a number of national laboratory accreditation organisations. NATA is a signatory to the MRAs of both the Asia Pacific Laboratory Accreditation Cooperation (APLAC) and ILAC. Pattern approval (in other countries this is sometimes called type approval) is mandatory for measuring instruments used for trade in Australia. When an instrument submitted for approval is successful, that particular pattern or type is approved and a certificate of approval is issued. For further information email: patternapproval@measurement.gov.au. 5.2 Authority responsible for issuing type approval NSC is responsible for issuing type approval certificates for trade measuring instruments. NMIA issues type approval certificates for trade and legal measuring instruments if they meet specific Australian standards. Australia has signed agreements with the National Measurement Office (NMO) in the United Kingdom and the Nederlands Meetinstituut B.V. (NMi), on the mutual acceptance of test reports for load cells, non-automatic weighing instruments and fuel dispensers (excluding liquefied petroleum gas). Australia also has an agreement with the New Zealand Ministry of Consumer Affairs on the mutual acceptance of test reports for non-automatic weighing instruments. Australia is a signatory to and actively involved in the OIML Mutual Acceptance Arrangement (MAA). NMIA is the authority responsible for testing for type approvals. However, NMIA has appointed external NATA accredited laboratories as approving authorities to carry out pattern approval testing of electricity meters, water meters and evidential breath-alcohol analysers. Environmental chambers for testing under a range of temperature and humidity levels. Please see NMIA website for current fee structure for pattern approval testing by NMIA. The instrument is marked with the verifiers verification mark. Disseminating standards of measurement, which are traceable to the Australian primary standards is through the appointment of verifying and certifying authorities, by NMIA under the National Measurement Regulations 1999 (Cth). Verifying authorities are appointed for trade measurement, surveying and utility measurements. Certifying authorities are appointed for regulatory measuring instruments such as police breath analysers and reference materials. One of the criteria for appointment is generally accreditation by NATA to ISO 17025. Since the legal requirements vary depending on the accuracy required there has been a hierarchy of standards developed which enables a range of accuracies to be disseminated throughout the community. 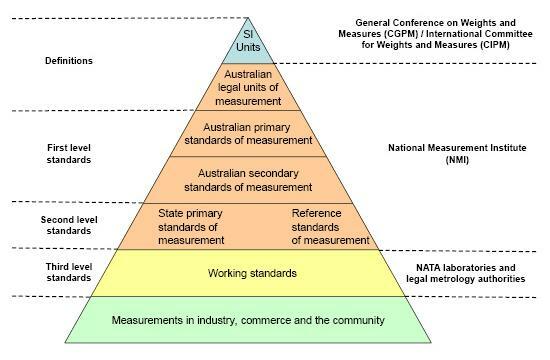 Australian primary standards of measurement for each of the legally defined units are maintained by NMIA, or its agents (see clause 3.2). NMIA may approve the pattern of measuring instruments used for legal purposes, including trade use. Products certification is provided by organisations registered by the Joint Accreditation System of Australia and New Zealand (JAS-ANZ). Only when a product or quality system has been certified to internationally recognised standards and passes the regular audits is an organisation licensed to use the Standards Mark on its products. Australia has adopted the ISO 9000 series of standards in their entirety as the national quality standards. It was published in Australia in 1987 as the AS 3900/lSO 9000, and given dual numbering to emphasise the ISO connection. utility meter verifiers to verify electricity meters and water meters. Technical officers are qualified in the fields of engineering and physical sciences. They spend up to 2 years following a formal training program which involves both classroom tuition and on-the-job mentoring and coaching. A further qualification is offered to experienced TMOs who are invited to enroll in the PSP50516 Diploma of Trade Measurement which can take up to 18 months to complete. TMOs with a diploma qualification are eligible to become Senior Trade Measurement Officers. TMOs who conduct licensee audits are expected to completed the unit of competency: PSPREG024 — Conduct Measurement Licensee Audit. This is a unit with the diploma qualification. NMI provides training in biological, chemical, physical and legal metrology. For a full list of our training courses please see, www.measurement.gov.au/training. As a registered training organisation we offer assessment for people who want to have their skills recognised. Participants who meet the requirements of an assessment are awarded a nationally recognised statement of attainment. On request we organise in-house customised training. The trade measurement legislation controls the measurement of pre-packed articles by quantity. The main laws include the National Measurement Act 1960 (Cth) along with the National Trade Measurement Regulations 2009 (Cth). The trade measurement legislation controls the measurement of pre-packed articles by quantity. The main laws include the National Measurement Act 1960 (Cth) along with the National Trade Measurement Regulations 2009 (Cth). ·have appropriate measuring instruments: any measuring instruments used to perform compliance sampling must be suitable for the task, and properly maintained to ensure they remain accurate at all times; and·assist trade measurement inspectors with any enquiries and provide information if required. ​The trade measurement legislation stipulates offences and penalties regarding the use of measuring instruments for trade and pre-packaged articles. The following are some of the major offences and penalties, and the corresponding sections of the Act that stipulate them. Please note that this is not an exhaustive list. Please see NMIA website for more information on Measurement legislation.